Optical active devices for 5G mobile and cloud services can be evaluated efficiency to improve time to market, says Anritsu, using the MS9740B spectrum analyser. The MS9740B has been developed for evaluating the output characteristics of optical active devices used by optical communications systems. 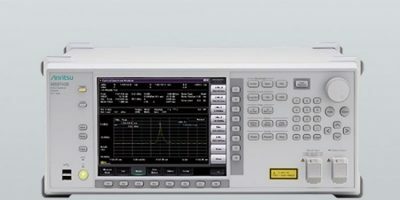 The spectrum analyser keeps the same measurement-sensitivity performance, functions, and size as its predecessor, the MS9740A, and, by optimising optical receiver bandwidth settings, shortens measurement processing times by 50 per cent, reports Anritsu. According to the company, this performance upgrade slashes optical active device inspection times and increases mass production-line efficiency. Introduction of next-generation 5G mobile and cloud communications services is expected to increase data traffic volumes, which means networks supporting this infrastructure are likely to experience increases in network traffic, leading to demands for increased module production and shorter inspection times to allow in-time delivery and faster rate optical modules at 10G, 100G, and 400G. The MS9740B benchtop optical spectrum analyser features wide dynamic range, high resolution and fast sweep speeds over a wavelength range of 600 to 1750nm. The device supports multi-mode fibre input and is ideal for manufacturing and evaluating 850nm band VCSEL modules. The MS9740B retains the same functions and performance as its predecessor, while reducing measurement processing times by up to half (Rx bandwidth setting: 1kHz or 200Hz) while overcoming problems of decreased measurement sensitivity caused by increased processing speed. The MS9740B retains optical active device (LD-Module, DFB-LD, FP-LD, LED, WDM and optical amplifier (NF and gain) measurement menu screens for evaluating devices. The device supports all-at-once measurements of key evaluation items, such as optical centre wavelength, level, OSNR, spectrum width and displays these results on one screen. Anritsu provides communications test and measurement solutions, helping customers to develop wireless, optical, microwave/RF, and digital solutions for R&D, manufacturing, installation, and maintenance applications, as well as assurance solutions for network monitoring and optimisation. It also provides precision microwave/RF components, optical devices, and high-speed electrical devices for communication products and systems. It also addresses 5G, M2M, IoT and other emerging and legacy wireline and wireless communication markets.